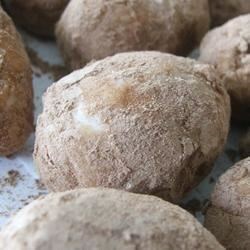 "A cute little confection that looks just like little potatoes. This kind does not contain potatoes; they are made using cream cheese and coconut." good taste but way to gooey and messy to roll. I even added more 10x sugar and that didnt help. I dont know if I did something wrong.Took to long wont be making again. Sorry. This recipe is great! It's just as good as the one's you can buy at See's candy. I did what See's did, though, and instead of just cinnamon, I mixed cinnamon with cocoa powder. Perfect! Very good. I let cream cheese mixture chill in fridge over night before rolling in hands to form individual candies. Came out great. Cute presentation for St. Patty's Day!